Artists' tropical island pictures remind us of their beauty and history. Tropical island photos are a reminder of memorable trips to the Great Barrier Reef, of tropical beach vacations, camping on a sand cay or just lazing around enjoying luxury vacations on islands such as Bedarra, the ‘mother’ in the group of Family Islands. 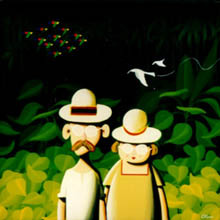 But for some, the artists amongst us, more lasting responses are in the form of tropical paintings, sculptures, writing, textiles and jewellery. Yvonne Cohen, Valerie Abbitson and Margaret Preston spent some years on Bedarra, where Noel Woods was to live for nearly sixty years. Weaver, Bruce Arthur, established an artists’ colony on Dunk, where I visited him in the 1980s. Tropical rainforest flowers, floating in huge clam shells, surprised us at strategic bends in the jungle path that led to the studio, where we were met by Bruce, a very hospitable and patient host. Other artists, such as jeweller, Liz Gallie, shared the studios from time to time. 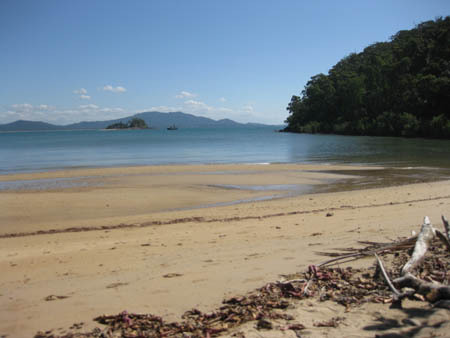 Ted Banfield, the beachcomber of Dunk Island, had decided that, as Dunk, or Coonanglebah, was the largest in the group of Family Islands, so named by Captain James Cook, it could be the father, with Bedarra the next largest, the mother and the smaller islands of Timana, Kumboola, Toolgarh and the others, the children! After Banfield’s death in 1923 his land was sub-divided and sold to various owners, who built an ever-expanding resort on the area where the house and gardens had stood. A small airfield caters for visitors and freight and a camping ground is an alternative place to stay (permit required from National Parks). Updated December 2011: As the resort and camping grounds were completely wrecked by Cyclone Yasi in February 2011 it would be wise to check whether they may be open again. The island has just been purchased so a re-building programme is likely in the near future. Current tropical island pictures show a swimming pool full of sand and vegetation stripped bare! My previous visit, which was a day trip, revealed new accommodation almost at the high tide mark, so guests were able to enjoy uninterrupted views of Brammo Bay and the mountains to the north-west. A large restaurant, also on the beach, catered for house guests and day visitors. The development was done in an unobtrusive manner so that my day-dreaming about the ‘isle of dreams’ was not interrupted too much by the harsh reality of modern tourism! One artist, whose engagement with the story of Ted and Bertha Banfield is ongoing, is Jim Olsson. The beachcomber’s lifestyle and attitude had struck a chord with Jim after he visited the island and read some of the books written by Banfield and also by Michael Noonan. 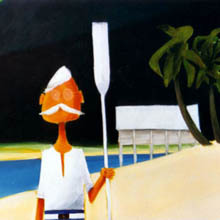 Jim exhibited in our gallery of fine art in Port Douglas in the early 2000s. 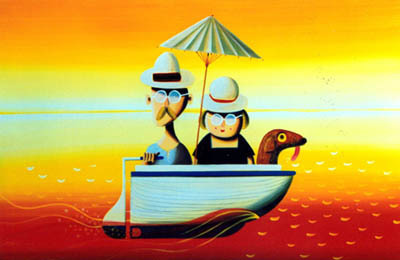 As well as his surreal series, it was the Banfield series that attracted most interest – and sales! JIM OLSSON (pictured left) trained in Sydney as a graphic artist and worked in publishing and advertising in Asia and North America, before studying electronic media in Canada. 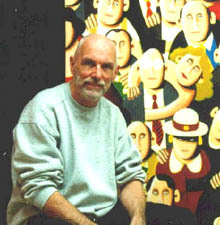 A prolific and hard working artist, he exhibited in many group and solo shows. 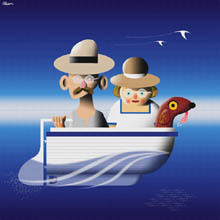 Of recent years he has abandoned his paintbrush to explore digital art, with impressive results. The paintings above, by Jim, tell of the day-to-day activities undertaken, often in their boat, by the Banfields. 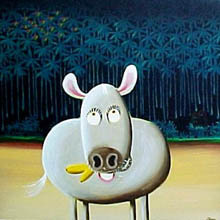 The horse was named Bananas when it was discovered that he responded brilliantly to bananas as a reward for good behaviour. In the days of using force for the 'breaking in' of horses that was a very forward thinking strategy! One is painted digitally. Can you tell which one? 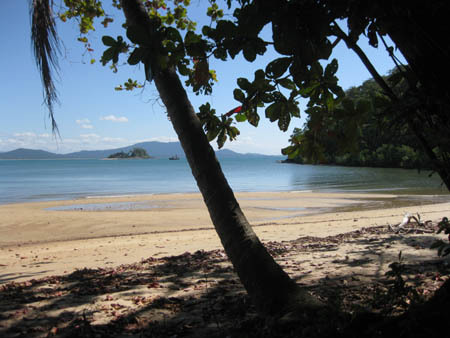 Do you have any tropical island pictures, either paintings, sketches or photographs that you would like to upload? Or stories about other ‘Robinson Crusoes’ that you would like to share? There's room for 4 images if you would like to tell us your story in pictures (and words) - please just fill in the form below - easy! Here's one more of mine - the view across to Muggy Point and Purtoboi Island from those new holiday apartments that I mentioned. Purtaboi Island across the bay. Do you have some great tropical island pictures?